One of the most common forms of archery is target archery. There are two different options when choosing and participating in target archery. 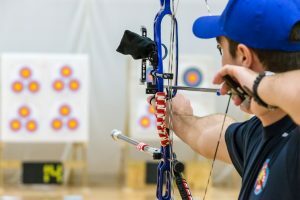 In many of the different competitions including tournaments as well as the Olympics, it is metric rounds that are executed by the archers. The rules that govern this type of archery are provided by the World Archery Federation. These rules are considered to be stricter and include timings. The scoring that is used in metric rounds is the 10 zone format. The Archery GB rules are what is used in the imperial rounds events. It is slightly more relaxed in regards to the format used for the competitions. There are groups of different rounds that are referred to as families. The shooting all takes place on the same field. The distances may vary but the same number of arrows will be used. Many competitors like the imperial rounds competitions because they can participate in a round that they feel most skilled to handle. The five zone scoring format is used for this. For those that really like to take part in the different tournaments, the international level is one of the most popular. These tournaments are governed by FITA. This is the International Archery Federation. There is a long list of rounds that can offer different levels of competition, such as…. Archery is also part of the Olympic roster, unbeknownst to many people. The beauty of the sport is the variety it offers. It offers a way to try something new for those from the most to the least athletic and those who fall anywhere in between. It is also a sport rich in history that is both fascinating and important.